I recently lost my last Schnauzer - Old man Dean. My oldest daughter decided I was not going to wait long to find a new Schnauzer friend. We contacted a local organization here in Utah P.A.W.S. 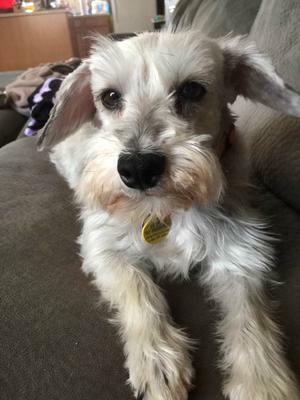 who had a little female Schnauzer in foster care for some time. Loreal or "Laurie" as we call her came to us about 10 days ago. She was one of FIFTY purebred dogs left in an Abandoned puppy mill in Lucerne Valley, California. Luckily Laurie was in fair physical shape when confiscated , its obvious she has had litters of puppies. She is 5-7 years old. She has some emotional issues, very shy, skittish, and suspicious of all humans. We have almost no information about her, we don't even know if she was a puppy of a puppy mill momma who was kept to start the next generation of puppies. It such a honor to have her in my home. She will be loved and adored as long as she lives. She has had a haircut, a microchip, spayed, vaccinations and a new name tag :) Laurie is already starting to warm up and will come up to you without coaxing, she will allow neck rubs and pets briefly. I think its going to awesome. This is our fourth Schnauzer, one died very young, and two at age 12 plus. PLEASE RESCUE A DOG - especially a Schnauzer because they are my favorite. Bless you! I've had four mini's, too. They are the best Family members you could ever hope for. Sweet pretty girl - so happy you found her after the loss of your handsome old man. I was so sad to hear about hear about his passing. 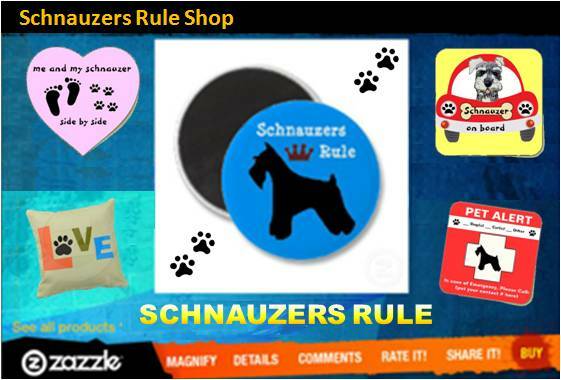 You and your family are mini schnauzer blessings! God Bless you and Laurie!!!! You are so lucky to have found a new little girl to fill the space left from old man Dean. She is a very pretty little girl and it sounds like she will do just fine with you. Hopefully she will get over any issues quickly but I'm sure with lots of love it will happen. Schnauzers are my favourite too.